Cloud Advantage – Enjoy Ease of Doing Business With Complete Operational Control! Allows Business Owners in expanding their businesses on a global scale by giving them a flexibility to track and manage all business orders & inventory transactions on the go. End-to-End Inventory Tracking to Boost Productivity! The purpose of an inventory management system is to, of course, manage inventory but GOIS makes it even simpler through its product centric inventory management functionalities. Quick Barcode Scanning For Easy Check-in Of Inventory And Products! 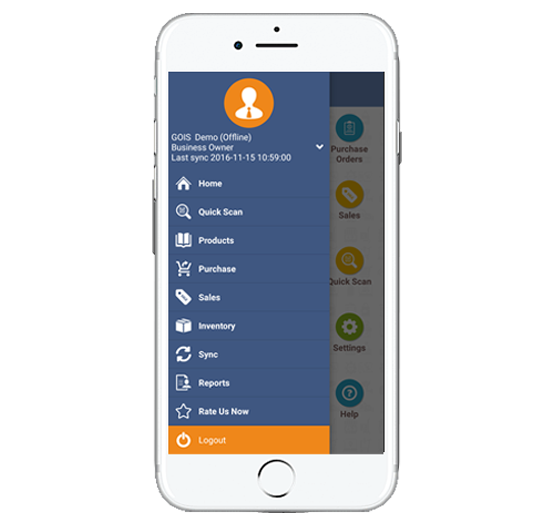 Use rear camera of your mobile device for scanning barcodes or use any compatible Bluetooth barcode scanner to perform quick barcode actions. Streamline Sales Channels and Assess Demands For Smart Purchases! With GOIS Pro’s user friendly purchase and sales management you can now raise purchase orders and punch sales orders on a system or on the go easily and as per your convenience, No gimmicks and completely hassle free. Powerful Analytics and Reliable Reporting for Insightful Projections! GOIS has powerful analytical tools to assess business growth and generate accurate reports to help you take intelligent business decisions.